Canadian and American residents wintering in the Riviera Nayarit will be on hand through March to help with the cleanup of their temporary homes. The Riviera Nayarit’s Beach Cleanup Network (BCN) begins its 2016 activities on January 16th with its 20th event. The collaboration of North American temporary residents with the BCN began last year and is happening again this year. It was noted in December the traditional groups involved in the cleanup were reinforced by foreigners who had been enjoying their vacation homes or visiting friends. 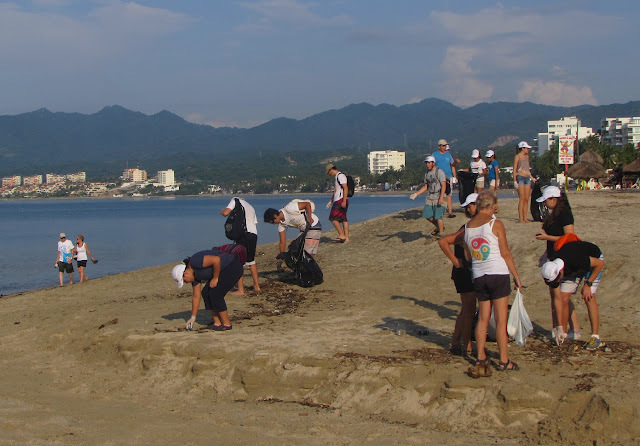 The year ended with the full support of different volunteer groups that dedicated their time to the cleaning of public beaches, streams and islands in Nayarit. The Riviera Nayarit Convention and Visitors Bureau (CVB) would like to extend its gratitude to all the 2015 participants that showed up and worked hard month after month. The preservation of the natural riches of the Destination as well as the community’s integration in a non-profit activity that encourages a slow but steady cultural change in the state’s coastal region are all excellent reasons to continue these activities in a more permanent manner. American and Canadian visitors, mostly adults who like to preserve the environment and have plenty of free time, are in line with the project and happily participate. This is their way to thank a Destination that allows them to exchange the freezing cold of the North for the warmth and excellent climate enjoyed in Mexico’s Pacific Treasure during the winter.